The electric-green storefront of local food market Green Aisle Grocery on Grays Ferry Avenue is a sign of change. Five years ago, the acupuncture clinic across the street or frozen Greek yogurt shop on the corner would have seemed out of place. But the new addition fits right into the flourishing neighborhood South of South. 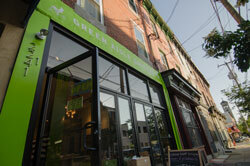 Green Aisle’s Grays Ferry location opened May 3. The store is more than four times the size of its Passyunk sister, with a full basement and outdoor storage area. In the back kitchen, the Green Aisle team prepares its in-house line of preserves and pickles, healthy salads and quick snacks, which the brothers plan to expand over time. Breads come from the Wild Flour Bakery and Lancaster-based Ric’s Bread. A reach-in freezer houses ready-to-scoop Little Baby’s Ice Cream. 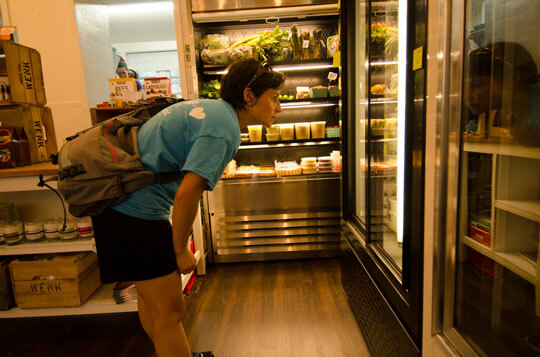 And there are plenty of hard-to-find treats for the most discriminating eater: Kona coffee mochi from Poi Dog Snack Shop, Brauhaus Schmitz brats, Giwa’s gochujang, and dulche de leche brownies from The Baker’s Jar. For a dinner party or a last-minute gift, Green Aisle offers a wide variety of artisanal cocktail bitters, syrups and finishing ingredients. Coffees from Blue Bottle, ReAnimator and Rival Bros are ready to round out the evening—and don’t forget the Mast Brothers chocolate! But is the neighborhood ready for such a selective curator? South of South Neighborhood Association (SOSNA) Programs Coordinator Andrew Dalzell thinks so. And, he says, Green Aisle’s opening coincides perfectly with the new farmers market options coming soon: The Christian Street YMCA will host a Wednesday market, and in late May the Julian Abele Park market returned on Tuesdays. If Dalzell’s enthusiasm is any indication, the neighborhood will embrace its new grocery store. “With all due respect to the current options, we are yelping with joy,” he says.